Follow a regular watering schedule during the first growing season to establish a deep, extensive root system. Feed with a general purpose fertilizer. Provide support such as a trellis or arbor. Prune annually to control size. Pruning time: winter. 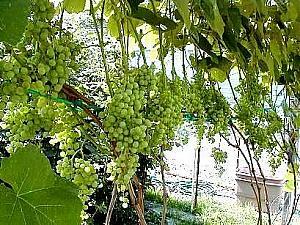 Grapes can grow wherever there is direct sun and sufficient air circulation. They're traditionally trained overhead onto shade arbors over outdoor living spaces. Also popular for training along fence lines and up over arbor gateways. May be cultivated on standard wire trellis used in commercial vineyards.